Though he wasn’t even a doctor, John Winthrop Jr. diagnosed and medicated hundreds of New Englanders in the latter part of the 17th century. He actually had another job during most of that time -- governor of the Connecticut colony. He ministered to an estimated one-tenth of Connecticut families. At the time, the colony had only about 5,000 inhabitants, and John Winthrop Jr. tried to heal at least 500 of them. Few physicians lived in Connecticut in those days, and they had scant medical knowledge. John Winthrop Jr., for example, concocted remedies that seem bizarre by today’s standards. To cure the plague, he burned and pulverized toads. His remedies also seemed weird by 19th century standards. Oliver Wendell Holmes, a physician, studied Winthrop’s papers and tried to figure out what he had given people. Holmes concluded he concocted his favorite remedy, rubila, from nitre (saltpeter) and some antimony (also known as kohl). “A little salt of tin may have been added, and there are hints of the presence of powdered 'unicorn's' horn’ (narwhal tooth),” Holmes wrote in a medical essay. “One can imagine yet other horrors." John Winthrop Jr. was born Feb. 12, 1606, in Suffolk, England, the son of the Puritan leader John Winthrop and Mary Forth, who died before he turned 10. He studied at Trinity College in Dublin and briefly studied law at the Inner Temple in London. Winthrop apparently didn’t want to practice law, and he had a keen interest in science and in travel. Before he followed his father to Massachusetts in 1631, he went to western France and to the Near East. Winthrop also attended medical lectures at the University of Amsterdam. Today, people know John Winthrop Hr. as the founder of the Town of Ipswich and the Saugus Iron Works in Massachusetts. In Connecticut, he founded Saybrook and New London. For most of the years from 1657 to 1676, he served as governor of Connecticut. But, as Holmes pointed out, John Winthrop Jr. was as much a physician as a magistrate. New London gristmill built by John Winthrop Jr. in 1650 as it appeared in 1910. 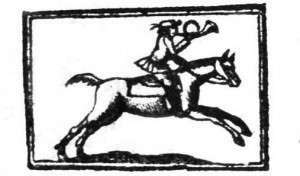 From about 1650 to his death in 1676, post riders along the Boston Post Road routinely carried Winthrop’s diagnoses and medications from his home in New London. New London became a hospital town to which patients came from all over New England seeking cures for a host of medical conditions. To help meet the New England-wide demand for his medicines, Winthrop distributed them through a network of female practitioners, elite wives who incorporated Winthrop's color-coded packets of medicines into their own healing services. His female practitioners included Elizabeth Davenport, wife of John Davenport, the Puritan minister who co-founded New Haven; Anna Mason, wife of John Mason, Winthrop’s deputy governor, and Mrs. Newton, probably the wife of Roger Newton, Milford’s minister. Even Roger Williams in Rhode Island wrote to John Winthrop Jr. seeking a cure for a parishioner’s daughter. In the 17th century, doctors considered purging a remedy for all kinds of illnesses. John Winthrop Jr. used his reddish powder, rubila, to stimulate powerful diarrhea and vomiting. He tried to cure plague, smallpox, fevers, king's evil (scrofula), insanity, falling sickness, broken bones, dislocations and burning with gunpowder. For inflammations, he recommended blood letting. For fevers, fasting in the early stages. And then there were his medications. Holmes classified them as simple, mineral and mystical. “Simple” included herbs like St. John's wort, Clown's all-heal and parsley. And then John Winthrop Jr. had his mystical drugs. He called his chief mystical drug his black powder. It supposedly cured the plague, smallpox and all sorts of fevers. He made it by putting live toads into an earthen pot so as to half fill it. He then baked and burned them in the open air until he could pound them first into a brown, then into a black powder. He got a truly bizarre recipe from Sir Kenelm Digby for curing fever and ague: “Pare the patient's nails; put the parings in a little bag, and hang the bag around the neck of a live eel, and put him in a tub of water. The eel will die, and the patient will recover." Another cure was a little more straightforward. Good wine, he wrote to a friend, was the best medicine for the friend’s wife. John Winthrop Jr. died on April 6, 1676.